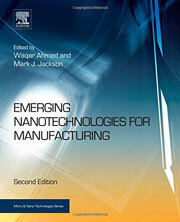 (Nanowerk News) In the second edition of Emerging Nanotechnologies for Manufacturing, Second Edition (Micro and Nano Technologies) , an unrivalled team of international experts explores existing and emerging nanotechnologies as they transform large-scale manufacturing contexts in key sectors such as medicine, advanced materials, energy, and electronics. From their different perspectives, the contributors explore technologies and techniques as well as applications and how they transform those sectors. With updated chapters and expanded coverage, the new edition of Emerging Nanotechnologies for Manufacturing reflects the latest developments in nanotechnologies for manufacturing and covers additional nanotechnologies applied in the medical fields, such as drug delivery systems. New chapters on graphene and smart precursors for novel nanomaterials are also added. This important and in-depth guide will benefit a broad readership, from R&D scientists and engineers to venture capitalists.